Amongst the picturesque surroundings of the Derbyshire Peak District is the River Lathkill – a cold, crystal clear river is full of brown trout. Unfortunately for them, during periods of dry weather, the river begins to dry up, as water gradually begins to disappear down underground mineshafts and soughs (an underground channel for draining water out of a mine). This was a job for me and my colleagues in the fisheries team! 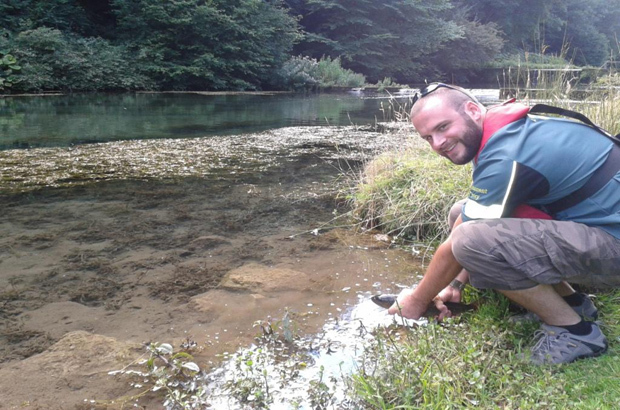 We arrived on site, kit at the ready to rescue and relocate the stranded brown trout. With our tank-trailer full of water and electric fishing gear ready to go we proceeded to wade the stretch of river, safely netting and placing the trout into the transport tank as we went. The electric fishing equipment does not harm the fish, it just lightly stuns them so that they can be caught in a hand net and put into our tank of water with oxygen. The stretch presented some challenges... fallen trees, heavy aquatic plant growth and uneven boulders all influenced our decision-making. This, coupled with significant variations in river depth meant that we had to adapt our techniques as we made our way upstream, alternating from wading with our lightweight boat (which is used to carry equipment) to wading the narrower, weed-choked areas with our electric fishing back-pack. After some hours we had reached the end of the stretch. Our transport tank was full of brown trout of various sizes and age classes and they were ready for release into their new flowing new home downstream. My team and I made our way to the location, passing members of the public enjoying their picnics in the bright, hot sunshine. 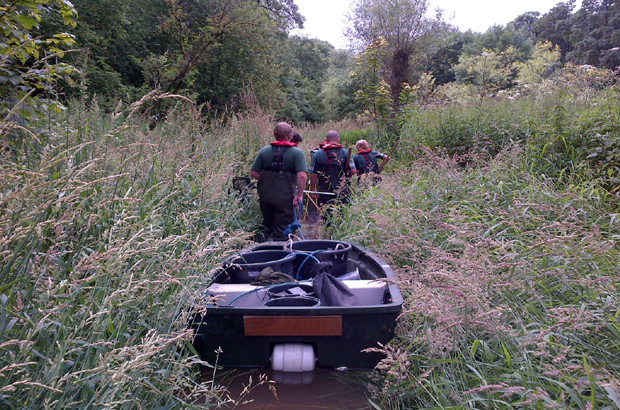 We felt rewarded as the trout were released into their new environment, weaving their way through the water weeds. We have streams and rivers in Maidenhead that are in worse conditions than that . An ancient chalk stream and pond has dried up due to debris blocking the stream as water receded and stretches that run further down into town are dried up these used to hold lovely sized brown trout and chub perch and carp . Are there any plans to check these out. o were of a strong river with small waterfalls. Many happy family days out spent here. Was only saying I would love to go back.